Keeping delicious memories alive, the Berkeley restaurant reopens in the hands of its original owner. 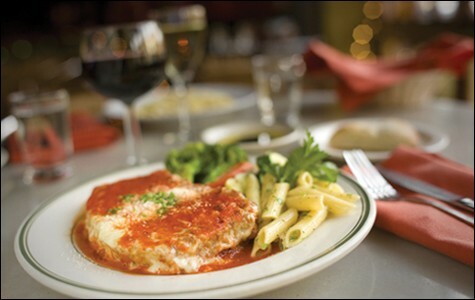 Every mouthful of the eggplant parmesan oozed juice, cheese, and a jolt of recognition. In the dim light, the minestrone gleams golden, its pasta shells a fleet of coracles, its zucchini wedges butter-soft. Its broth is robust with the understated eloquence of things tested by time. As Frank Sinatra croons I've been a puppet, a pauper, a pirate, a poet, a server brings a basket of soft-centered, steaming-hot, herb-specked, house-made foccacia, wrapped in a thick cloth to keep them warm. A bowl of olive oil and balsamic vinegar arrives, to dip them in. What is this place with its century-old family recipes, its friendliness, its glowing hearth? It is the past. You thought you could never go back there. You never dared dream. But behind a dark and heavy wooden door on Shattuck Avenue, the past is still in business. Its lasagna is beefy. Its pizza wears no pears. Serving classic Italian fare in the same earth-toned, softly glowing space since 1961, Giovanni is one of the last still-standing Berkeley restaurants enlivening the childhood memories of local folks aged fifty-plus. The ravioli they remember is still made here now in the exact same way by the exact same hands: Sous chef Juan Sanchez has been doing it for forty years. No puny portions here. No images of Che. Giovanni is a relic. As such, it has not endured unscathed: After a period under alternate ownership that almost spelled its end, Giovanni closed briefly this year, then reopened in October in the hands of 79-year-old founder, Giovanni Schipani. Fresher-than-ever ingredients now fortify a menu that has barely changed since 1961. And grazie a dio for that, as hand-hewn fettuccini needs no tweaks. Served here in several different styles — including a velvety, peppery Alfredo — it's seductively resilient between the teeth. Italian cuisine was already nearly perfect not long after Christopher Columbus brought tomatoes home from the New World. Schipani was an entrepreneur by age sixteen, when he opened an ice-cream shop in his Indiana hometown. As a young man, he bought a downtown-Berkeley building that had formerly housed a muffler store. He spent two years outfitting that space with elegantly sassy Rat Pack chic: central fireplace, plump vinyl banquettes, wrought-iron trim. The dining room was windowless: common back then, but womblike, with a four-wall mural depicting Venice in biscuit browns and rusty reds. The restaurant thrived. Schipani's Calabrian mother arrived daily at dawn to make meatballs, cannoli, and sauce — watched closely by Sanchez, who climbed the ranks from dishwasher to chef. In 1969, Schipani married the restaurant's hostess; their daughters Sara and Anastasia grew up watching pasta boil. At age six, Anastasia Schipani was setting tables. At eight, she used a microphone on crowded nights to tell patrons their tables were ready. "It was such an exciting place," she remembers now. "Because of that, restaurants are now part of my being." Schipani retired in 1987, selling his beloved restaurant to his employees. "But they didn't do a good job. They were using garlic powder instead of fresh garlic," said younger daughter Sara Schipani. "People didn't want to come here anymore." No longer able to pay their rent, the ex-employee/owners finally sold the restaurant to their landlord: Giovanni Schipani. It's a family enterprise again, and fresh garlic is back — along with a breakfast menu (fried-egg panini, "Gio Special" spinach-and-eggs), more and better cheeses, abundant fresh produce, and seasonal treats such as the locally harvested wild truffles and chanterelles that enriched several dishes this month. Our folksy, filling chanterelle risotto was studded thickly with fresh fungus. A crisp counterpoint to such soft, unapologetic richness was the Giovanni Salad: chopped lettuce, carrots, beans, tomatoes, olives, salami, mozzarella — like hefty confetti, in a creamy garlic dressing. Unlike the paper-thin pizza crusts ubiquitous elsewhere, Giovanni's medium-width crust is chewy inside, blistery around the rim, awash in cheese and sauce — like pizzas of yore whose messy generosity you (admit it) once loved. Ours was topped with fresh onion and tomato, Kalamata olives, and enormous hanks of marinated artichoke. Kalamatas also jeweled our bucatini puttanesca, which was pretty and piquant but just okay — prepared with store-bought dried pasta, which inhabits a different universe than Giovanni's house-made fettucini, ravioli, gnocchi, and lasagna. Penne (also store-bought, sadly) and a heaping helping of tasty al-dente vegetables flanked an eggplant-parmesan slab. Every tender mouthful oozed juice, cheese, and a jolt of instant recognition. 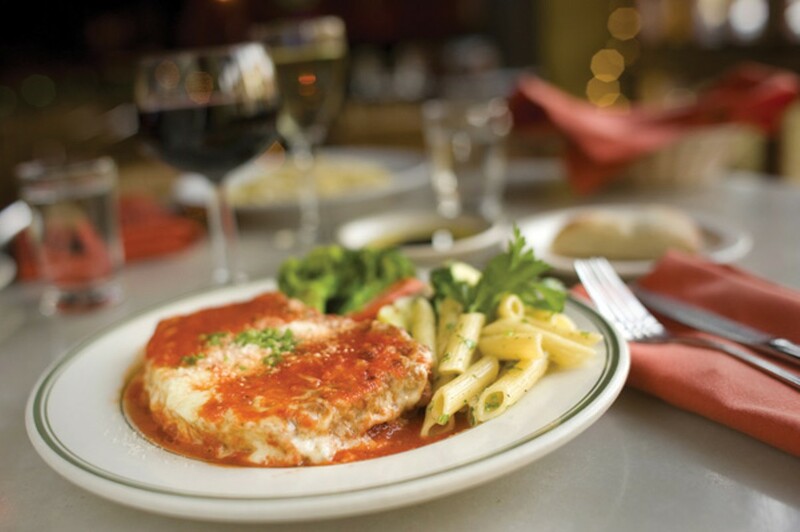 Ditto chicken parmesan and veal Marsala. If you grew up in Europe or North America, these dishes are programmed into your sensory hard drive. They're the complex treasures of a once-glorious empire. With this least foreign of foreign foods, "back to basics" is not basic at all. Giovanni still has a few kinks to work out: The service was spot-on one night, sweet but spacey the next. But cue the dim lights, soft music, ample tables far apart: This is the gentle ambience that time and trendy restaurateurs forgot. Current styles dictate that anything fancier than fast food mandates some degree of orchestrated postmodern discomfort: tiny, too-close (or privacy-free communal) tables; harsh decor; bizarre show-offy ingredients; starvation rations; a din. Comfy-cozy Giovanni makes those places seem part of a nihilistic plot to hasten civilization's decline. Don't let them, and the best way not to let them is to order Giovanni's tiramisu. Heaven for two and pass-out ecstasy for one, these logic-defyingly fluffy alcohol-soaked layers are OMG territory, even if you think you know tiramisu. What culture would put wine, cheese, coffee, whipping cream, and ladyfingers in the same dessert? A culture that has earned the right. This is the past. It waits, tried and true like that ex you never should have cheated on. You ask, Can I come back? and Giovanni says, Of course. Want a spoon?